As a parent, your baby’s safety is the biggest priority for you. In the initial stages of the baby’s growth, utmost care should be given to keep them away from anything that is harmful to their body. UV rays in sunlight can cause great damage to human skin. A baby’s skin is extremely soft and sensitive. A good sunscreen can protect your baby from sunburns and other skin related problems that harmful UV rays cause. Investing in a good sunscreen lotion for your baby is a good idea. You may be confused about which sunscreen to buy as there are a lot of options in the market! We bring you the best baby sunscreens for your precious ones to protect them from harmful sunlight whenever you go out. This is one of the best products in the category. If its a day at the beach or pool, it is an open invitation to sunlight all day long. 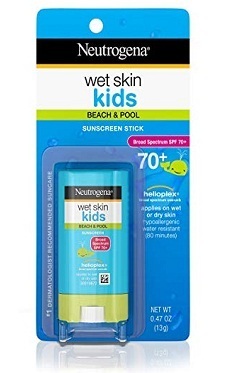 Neutrogena’s Wet Skin Kids Sunscreen Stick works well on both dry as well as wet skin. It cuts through the water layer to create a water-resistant film on your baby’s skin for a period of up to 80 minutes. It comes in a 0.47-ounce stick offering an SPF 70 protecting against UVA and UVB rays. This sunscreen made from the PABA-free formula is hypoallergenic, oil-free and approved by reputed dermatologists. Easily applicable without getting your hands greasy. Does not cause a tugging of delicate skin, which is essential for a good sunscreen for toddlers. May need additional care to keep the sunscreen on the skin while wiping your face. There are small parts on the sunscreen stick which you need to be cautious with when around kids. For a product at a reasonable price, this is the most value-for-money sunscreens out there. It is also incredibly smooth to apply on skin, which is another great plus point of this product. Parabens, Oxybenzone, chemical fragrance, phthalates, and retinyl palmitate, are some of the chemicals that sunscreens contain. Your baby’s skin is sensitive, and it is inadvisable to put the child’s skin in the presence of such harmful chemicals. 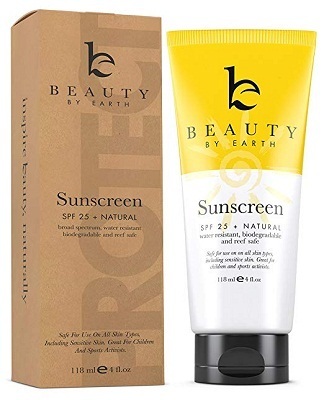 This fantastic product from Beauty by Earth provides the perfect solution – a sunscreen-free from all these chemicals. Made from natural ingredients like Organic Aloe Vera Juice, Coconut Oil, Shea Butter, Argan Oil, Jojoba Seed Oil, Vitamin E and Cucumber Extracts – this is an entirely eco-friendly solution for your lovely babies. This is a mineral-based physical sunscreen that offers an SPF 25 protection film. A big plus point is that it is easy to apply on skin and is non-greasy. This is a completely eco-friendly sunscreen made from natural ingredients, making it the best sunscreen for babies with sensitive skin. This product is extremely hydrating and is gluten-free. The baby’s skin may appear slightly pale due to the application of the sunscreen, as the product is entirely natural and thick. It may be advisable to go for a sunscreen with higher SPF protection in case of extreme exposure to sunlight. From the packaging to the product to the brand, Beauty by Earth is completely eco-friendly. Even at a slightly higher price, it is a steal because it is natural. 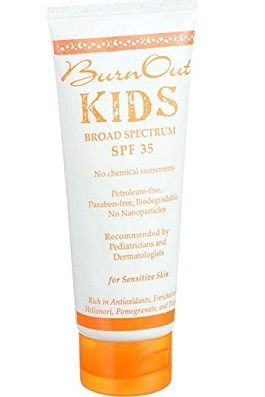 Burnout Kids offers an SPF 35 protection against the skin ageing UVA rays and the skin burning UVB rays of sunlight. This great product provides a broad spectrum of protection against these rays. Moreover, this excellent product is chemical-free, biodegradable and ocean safe. At an affordable price, it offers excellent value for money by protecting your baby’s skin. It is a favorite among dermatologists and pediatricians and is strongly recommended by them as their prescribed sunscreen for babies with eczema. The sunscreen is hypoallergenic and does not cause any blackheads on the king due to the blocking of pores. In short, this is an excellent product for use on extremely sensitive skin, such as your precious babies. Extremely effective for broad-spectrum protection, against both UVB and UVA rays, which are both harmful. Rich in antioxidants, especially extracts of Papaya, Plantain and Plankton. This may be less light and creamy like the physical sunscreen from the same brand. May have a slightly greasy sensation after application, which is common for most of the sunscreen lotions offering protection from the broad spectrum range. This is a fragrance-free formula, which ensures that your baby’s skin is not exposed to unwanted chemicals. This makes it extremely desirable, especially for kids with extra sensitive skin. Thinkbaby is one of the best-known brands in baby care products, especially their skin-friendly sunscreen solutions for your baby’s highly sensitive skin. This is a broad spectrum sunscreen having a mineral-based formula, which ensures that you get the consistency and texture after applying that you get with a physical sunscreen without compromising on the protection that it offers, that is against both UVA and UVB rays in the sunlight. Thinkbaby Safe Sunscreen comes in an attractive tube having 6 ounces of sunscreen in every unit, offering SPF 50+ protection against the UV rays. It is water resistant for 80 minutes and offers a non-nano and non-aerosol formulation to ensure that your baby does not inhale harmful chemicals. Also, this sunscreen does not have the foul smell that is synonymous with many of the organic sunscreen formulations. To top it all, this is 100% made in the USA. The brand is internationally approved to be chemical free and has a purely mineral-based formulation. This is one of the products in the market with the lowest risk score for the SPF they offer. May not be the best product to use for babies who have sensitive skin conditions, like eczema. It might be less effective against UVB as compared to UVA rays. This is undoubtedly one of the best brands of sunblock for kids in the market at a slightly high price. However, it is approved by Whole Foods, recommended by Lucie’s List and has a surprisingly lovely smell for an organic mineral-based sunscreen, which is hard to find. Definitely worth every dollar you pay for this – after all, it is for your precious bundles of joy. There are a large number of sunscreen formulations that claim to be organic, but none of them is completely organic. Babyganics practices what it preaches by delivering you a completely organic solution that takes extra care of your baby’s extra-sensitive skin. 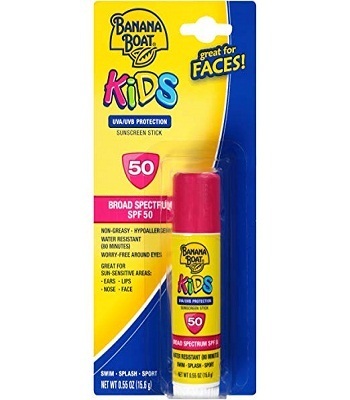 This sunscreen stick delivers SPF 50+ tested protection in a 0.47-ounce unit. The formula is completely mineral-based and free from fragrance chemicals and parabens. Every Babyganics sunscreen review by happy customers speaks volumes about the brand’s commitment to providing a completely organic solution to sunscreen formulations. One of the most organic, chemical-free products available in the market at present. The stick format for sunscreen offers excellent ease of application. Like every truly natural product in the market, the shelf life of this product is also limited to a few months, unlike chemical-based sunscreens which are unaffected for years. May cause a slight whiteness when applied due to thick mineral-based formulations for extra protection from sunlight. This is one of the few completely natural options for sunscreen sticks available in the market. The ease of application provided by a stick makes it easy to use while your baby moves around while applying sunscreen. And the price point of $3.50 per stick makes it a steal for your baby. 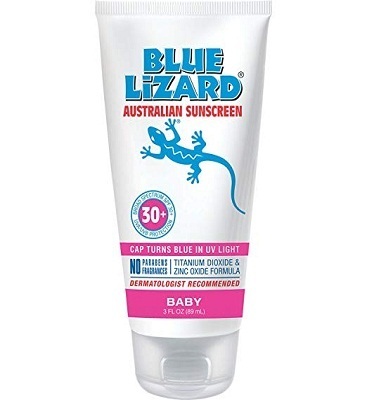 Blue Lizard is a brand that boasts of having the trust of Australian dermatologists for over. Unlike several products available in the market, Blue Lizard sunscreen does not have any chemical-based fragrances or parabens, making it extremely safe for applying on your child’s soft skin. This completely mineral-based formulation offers SPF 30+ protection with a 10% Zinc Oxide and 5% Titanium Dioxide in a 3-ounce tube. This sunscreen offers water-resistance for 40 minutes. Australian dermatologist recommended product, where Australia has the most stringent rules on sunscreen materials. Extremely affordable pricing for the value it provides. The water resistance standards are for 40 minutes, where many industry alternatives provide 80 minutes of water resistance per application. This is an entirely mineral-based sunscreen solution that mirrors out most of the harmful rays of sunlight that falls on your skin, like tiny mirrors on your skin. Banana Boat is also one of the largest brands in the business out there. Banana Boat is characterized by a strong community of loyal customers which fall back on a Banana Boat sunscreen stick over any other solutions available in the market. That is because this sunscreen stick delivers to the expectation of its customers, offering strong sun protection of SPF 50. Being extremely easy to apply, this is one of the most suitable solutions for squirmy toddlers. The fact that it does not drip helps in the application on babies and toddlers. Moreover, it has an extremely pleasing smell. Every unit offers 0.55 ounces of sunscreen offering an SPF 50 protection on each application. It protects your babies against both UVA and UVB spectrum of rays. This is arguably one of the best kids sunscreen sticks out there in the market. It lasts much longer than the regular sunscreen solutions out there in the market and protects you against both UVA and UVB rays. It is also extremely lightweight, hypoallergenic and clinically tested for best results. It contains mild chemicals like Avobenzone and Octocrylene, which have been tested safe for babies and kids. This is not a completely organic solution but uses some of the safest and best materials for your baby’s body to protect them from the harmful sun rays. At an affordable rate, this might be one of the most low-priced baby sunscreens available in the market at present. Definitely a recommended product considering its patented AvioTriplex technology that guarantees your baby’s protection from harmful UV rays in sunlight. Coppertone is a brand that is completely dedicated to protecting kids from harmful effects of the sun’s rays. This amazing photo-stoppable solution provides an SPF 70 protection against broad spectrum range of UVA and UVB rays. This hypoallergenic moisturizer sunscreen is created using unique blends designed to keep your baby’s skin as soft as it is supposed to be. Offers the highest industry standards of water resistance of 80 minutes from the time of application. It is a premium priced product at $9.47 for an 8-ounce bottle. This is a great sunscreen that absorbs into the skin well. What you will love about it is the fact that this does not compromise on the sun protection this gives with its SPF 70 protection. Sunscreen is a necessary product for your baby, because of the harmful UV rays in the sunlight that damage baby skin. Your babies deserve the best protection from the sun that money can buy. With the sunscreens mentioned above, your babies are always protected from sunlight, without being exposed to harmful chemicals. After all, they are your bundles of joy – the miracle of life that you have been blessed with. They deserve nothing but the best!